Imagine thousands of people running around Miami looking for a bus terminal so they can tell a bum there the word “Booger”. Imagine standing on a beach, looking at a pair of giant dice while a rabbit runs around saying “What’s up Doc?” Imagine giant inflatable pool balls sitting in various locations around town, without explanation. Weird dreams? Well, sort of. It’s what you’ll see at the Herald Hunt. The Herald Hunt is a fantastic puzzle game put on by Miami Herald masterminds Tom Shroder and Dave Barry. I wasn’t able to go to the Herald Hunt this year, but a couple of friends of mine did. One of them, Andy Wenzel did a fantastic job documenting the Hunt this year, on his website TropicHunt.com. (Why “Tropic Hunt” and not “Herald Hunt”? 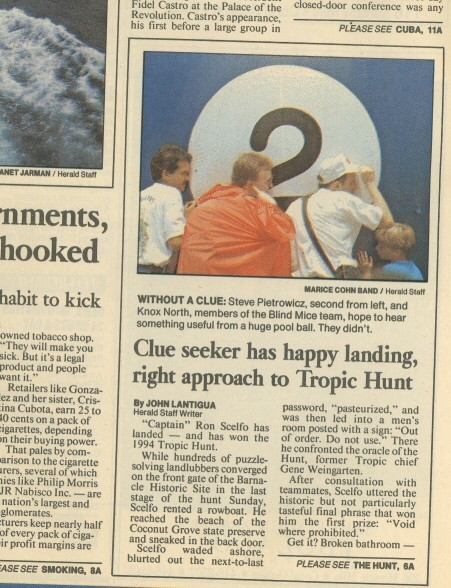 Tropic Hunt was the original name, until the demise of Tropic Magazine, the magazine supplement to the Miami Herald). Be sure and check out TropicHunt.com! Update: Andy (The TropicHunt.com Guy) Wenzel and I worked on a special write-up of The Hunt which incorporates “24” in the form of a report from Chloe. Hope you like it. The third issue of Knucklebones magazine is come out. This magazine features all kinds of board game news, and is one of the few magazines that’s interesting from cover to cover. You can pick it up from Border, Barnes and Noble, your local game store or Amazon.com. Ticket to Ride is a great board game for the family. Each player is given several secret destination cards, and you all must build a continuous train between each city listed on the cards. Some routes have allow multiple trains to go through at the same time, sometimes you have to go around blocked routes, and you have to complete your trains before your opponents do. We played this with the kids, and they had a great time. You can play this game in about two hours or so. Ingenious is an abstract tile placement game that is quick, simple to learn, and fun to play. Each player has tiles to place on the board, and one tile is placed each turn. The game is scored by counting the number of like symbols that occur in a continous chain you’ve just placed. So, for example, placing a piece with a circle and triangle will earn you points based on the number of circles in the chain, and the number of triangles in the chain. The winner is the person who has the most “least points” scored for any particular symbol, meaning, look at the lowest point total you have for your symbols, and that’s the score you have. This is a game that’s easy to learn, and very fun to play. Highly recommended. A friend just pointed me to Knuclebones magazine, a board game magazine. It looks pretty good. The current issue has articles on German board games, the success of Settlers of Catan, and a profile of Rio Grande games.